Those who know me well know that I can say with all honesty, “I never met a dog I didn’t like.” I admire each and every one of them from the family pet to the search-and-rescue dogs, as well as those who assist the physically disabled and bring a well being to the emotionally challenged. I want to give the deserved recognition to them as well as some of the other animals that not only bring us joy and companionship, but also do remarkable jobs to benefit and enhance our lives. In 1999, an experimental program, called The Guide Horse Foundation, was started with the purpose of training miniature horses to assist visually impaired people. There is a critical shortage of guide animals and Guide Horses have shown great promise. They perform exceptionally well at keeping their blind companion safe and seem to be a wonderful alternative for blind horse lovers, those who are allergic to dogs, and those who want a guide animal with a longer lifespan. 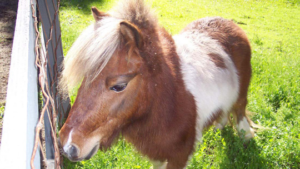 Many people who are afraid of dogs are often comfortable having a miniature horse to assist them. They are also strong enough to provide support for people with physical disabilities by helping them to rise from a chair or bed. Reports show that the Guide Horses demonstrate excellent judgment; like choosing a ramp instead of stairs, and are not easily distracted by crowds and people. Here’s something I bet you didn’t know. Guide Horses are very clean and can actually be house broken! In a study, conducted by the Pine Street Foundation, a cancer research organization in California, compelling evidence showed that cancers hidden beneath the skin can be detected by dogs sniffing the odors of a person’s breath. According to the foundation, dogs with only a few weeks of basic training learned how to accurately distinguish between breath samples of lung- and breast-cancer patients and healthy subjects. Previous studies have confirmed the ability of trained dogs to detect skin-cancer melanomas by sniffing skin lesions. Nicholas Broffman, executive director of the Pine Street Foundation, states that lung and breast cancer patients are known to exhale patterns of biochemical markers in their breath. Cancer cells, he goes on to explain, emit different metabolic waste products than normal cells, which can be detected by a dog’s keen sense of smell, even in the early stages of disease. Helping Hands: Monkey Helpers for the Disabled is a national nonprofit organization that provides highly trained monkeys to assist quadriplegic and other people with severe spinal cord injuries, with daily activities. The monkeys are raised and trained to act as live-in companions who will provide the gifts of independence, companionship, dignity and hope to the people they help. The monkeys are trained to respond to a laser pointer and can pick up objects from the floor that would normally stay there until help arrived. They can open a refrigerator, retrieve a bottle of water, open the cap, insert a straw into the bottle, and put the bottle into its holder on the handicapped person’s chair. They turn lights on and off, bring the telephone and remote for the TV, and do other tasks that would otherwise not be possible in the daily lives of people who can’t, including putting in a CD or DVD, flipping pages in a book or magazine, scratching itches, and even warming up food in the microwave. These wonderful loving animals are not only companions but they are the caregivers as well. They never cease to amaze me and have earned my utmost respect.